During a group discussion at the India Deaf Society about the suburban trains in Mumbai, Bhaskar, a young deaf man suggested that a new rule could be introduced in the trains’ “handicapped compartments” (as they are called by Mumbaikars). He thought that the number of conflicts over the occupation of seats would be abated if a reserved-seat area was installed within the compartment. The reserved-seat area would be for blind people and for people who have disabilities in their legs or back which cause difficulties in standing, and not for deaf people and people with minor disabilities. As such, he suggested the idea of formalizing a binary hierarchy of bodies, in contrast with the complex hierarchies that are in play on an everyday basis in these compartments. His suggestion implies that he thought an increase in formal rules (imposed by the state or the railroad governing body) about how to inhabit and use the space of the compartments would be desirable. Every day about 7 million people ride the Mumbai suburban trains, which constitute the most intensively used and overcrowded rail network in the world. 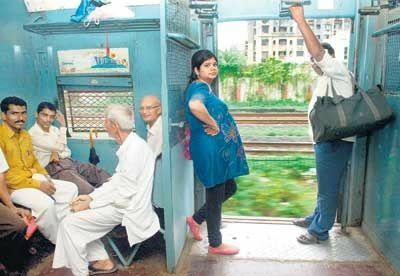 In contrast to public transport in most other countries, in Mumbai, the trains are compartmentalised in a complex manner based on gender, class, luggage type, and “handicap”: the first and second class general compartments, ladies first class and second class, luggage (for vendors with loads) and the above mentioned “handicapped compartments”. Compartmentalising ideally makes travel without sexual harassment possible for women and provides people with disabilities and people with luggage with relatively more space to enter, alight and navigate the compartments. Figure of the order of compartments in a 12-car maroon old (as opposed to white-purple new) train in Mumbai. Diagram by author. Along with changes in train design and in the number and allocation of compartments, as well as an increase in the length of trains, compartments for disabled people have increased in size over the years. Subsequently, the number of travelers in the handicapped compartments has increased and become more diverse, such as the much-contested addition of pregnant women and an increase in the number of able-bodied unauthorized travelers. This leads to conflict: the question of who can claim the space of these reserved compartments is negotiated in everyday interactions in the compartments. Governmental regulations as to whom is entitled to travel in the compartments do not suffice here and are sometimes overruled as the space is governed by the passengers themselves. The passengers do not just decide who can travel in the compartments, but also who has the right to sit. Whilst Bhaskar suggests greater government regulation by installing a separated reserved-seat area, such a suggestion does not recognise the complex dynamics that are at play in the compartments. This article documents how the passengers travelling in the handicapped compartments try to create an inhabitable world, making the space liveable for the duration of their trip. I am a Belgian deaf woman and an anthropologist. My husband and his family are deaf Mumbaikars who communicate in Indian Sign Language. This article is based on research between 2007 and 2014 (including 3 years of living in the city), consisting of participant observation, 2 case studies, 12 interviews and 4 discussions in deaf clubs. Whilst my research mostly focuses on deaf perspectives, I also draw on conversations with other disabled travellers, the president of the Mumbai-based Disability Advocacy Group (a disabled train commuters group), and ticket officers. Having separate compartments (rather than seats or areas) for people with disabilities seems to be quite unique. It is in contrast to the organising alternative, entirely segregated transport for disabled people such as dial-a-ride, paratransit, or handicabs. It also contrasts with (theoretical) Universal Design directives aimed at making spaces such as public transport widely accessible for all (such as by providing ramps to enter trains and buses and by providing polyvalent spaces that can be occupied by wheelchairs, strollers, luggage and bicycles. 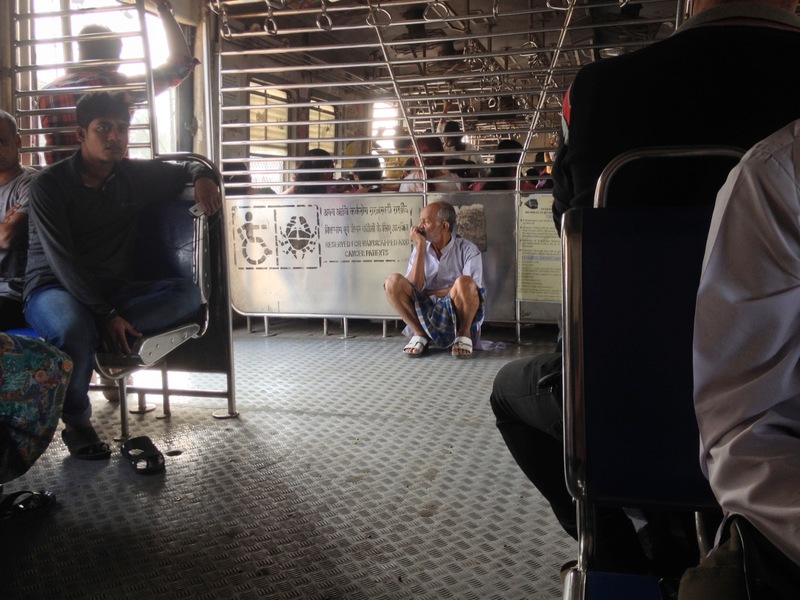 Importantly, in Mumbai the handicapped compartments are not necessarily “accessible” by universal access standards. There are many barriers for people with disabilities to get to the compartments: there are no lifts and few ramps in train stations, and to enter or alight the train, people have to negotiate a high step, for example. There are some infrastructural differences between the handicapped compartments and the general and ladies’ compartments: there is no pole in the middle of the doorway that would hamper entrance, and benches can hold only two instead of three people. However, it is not so much the infrastructural difference that makes this compartment more accessible (in contrast with the trend of Universal Design), but the lower density of commuters. Consequently, the Disability Advocacy Group (DAG) (see below) mainly focuses on keeping these compartments free from non-disabled encroachers, rather than lobbying for a higher accessibility of trains and train station infrastructure. The compartments contain 6 benches for 2 people (occupied by 3 when it is crowded), one long bench in the back where 7 people can sit comfortably, and ample standing space (with handholds on the ceiling). The doors can be closed but generally remain open in order to let air pass through the compartment and to make the alighting/boarding process which starts when the train is still running easier. 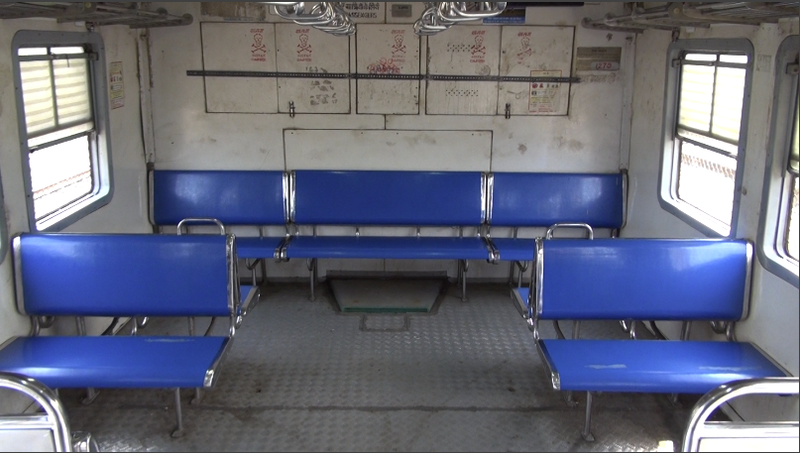 Empty compartment and compartment where most seats are occupied. Photo by author. The traveller body in the handicapped compartments during rush hour mainly consists of people who commute to and from their work and wear neat office outfits. Outside rush hours the traveller body is more diverse, consisting of people who travel for a more varied number of purposes: workers with irregular hours, housewives, and senior citizens. Most commuters are male, though an increasing number of women ride in the handicapped compartments since the arrival of new white-purple trains in 2002. These trains are better lit and more spacious than the older maroon trains with smaller handicapped compartments. The majority of passengers are people who have disabilities that do not prevent them from negotiating the infrastructural limits of the trains and train stations and/or from commuting to and from school or a course or (office) job in the city. These people for example have a deformed hand, a missing arm, leg or toe, have a disability in their back or leg(s), are blind or deaf. People with intellectual disabilities typically travel accompanied by a member of their family. Whilst a number of people use one or two walking sticks or crutches, people in wheelchairs or with severe mobility disabilities are typically not seen in the compartments, though a minority of legless travelers use small handmade boards on wheels on which they sit to navigate and hop in the compartment using their arms. Crowd in a handicapped compartment. Photo by author. When it is very crowded, up to 30 people sit in the sitting spaces designed for 19 people and many more people stand. Encroachers stand in the portal of the compartment (though they also stand in the compartment itself when it is really crowded). 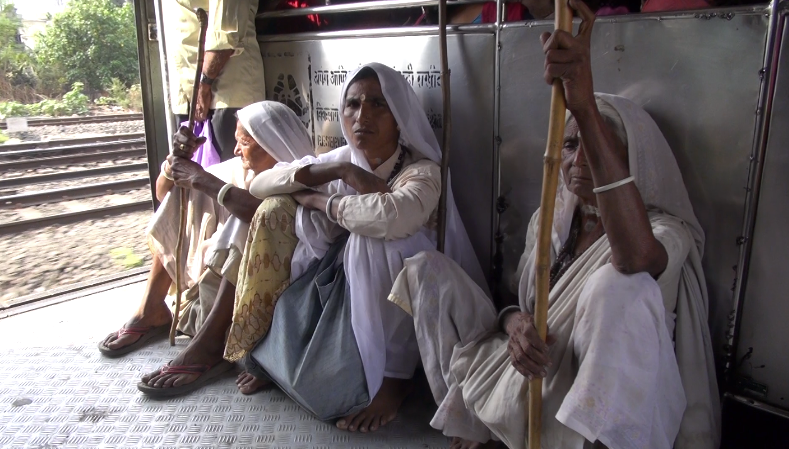 On the floor near to the doors, a number of people often can be found sitting or squatting: these include often unauthorized travellers such as beggars; hijras (people who are born as men but emasculated, and usually dress as women, and who are part of hijra communities); poor non-disabled people; old people; and people with leprosy (who, despite having a disability, are not authorized to occupy the compartments). In addition, there are also authorized disabled travellers who might prefer to squat or sit on the floor rather than sit on a bench, and/or who enjoy the breeze in that area. The space near the doors is thus an ambiguous space: it is an in-between space for people who do not fully belong while it is also a desired place where people can stand or sit in the breeze and then quickly alight from the compartment. People sitting on the floor near the door. Photo by author. Disabled people already in the compartments scrutinize people who enter them for visible signs of disability. My husband and I were often addressed (most of the time in a friendly way) by being asked: “handicapped?” (usually in English) as deaf people typically do not look disabled at first sight. Carrying a disability certificate at all times is a means to avoid or alleviate conflict when people suspect that someone is not a bona fide disabled person. The certificates are, in addition to a valid ticket, the documents that entitle people to travel in the “handicapped compartments”. Travelling in reserved compartments without the right documents (occasionally checked by ticket officers on the train and platforms) is a breach of the law (section 155 in the Railways Act), and punishable with a fine (500 rs, about ten US dollars) and jail sentence (3 to 6 months). The certificate can be obtained at Sir Jamshedjee Jeejeebhoy hospital, a government hospital in the city centre, a tedious process consisting of medical evaluations and complex bureaucracy. During this process, people are allocated a percentage of disability. For example, profoundly deaf people who don’t speak get 100% allocations. There is not a clear document available on who is allowed in the HC, only some general guidelines: a senior ticket officer told me that a disability of a minimum of 40% is necessary, and that people who can see from one eye or have a missing digit are not allowed in, however such people carry a certificate (with their low percentage) and could often be seen in the compartment. People with cancer and pregnant women in advanced pregnancy are also allowed. Similar to the disability certificate, cancer patients carry a “cancer card” and pregnant women have to carry a doctor’s certificate with their due date. In negotiating or granting access to the compartments, people make use of these certificates in a strategic way. As described above, the lack of a certificate is used as argument to keep people out. However, some people without certificates are allowed by conductors and fellow travellers because they are disadvantaged in crowds due to young age (schoolchildren) or old age (elderly people), sexual harassment (hijras), or weakness (illness/injuries). (However, not all of these travellers are regarded as having the right to occupy a seat). In yet other cases, the certificate or other documentation does not convince fellow travellers of someone’s right to enter (such as in the case of pregnancy) or occupy seats (such as in the case of deaf people). 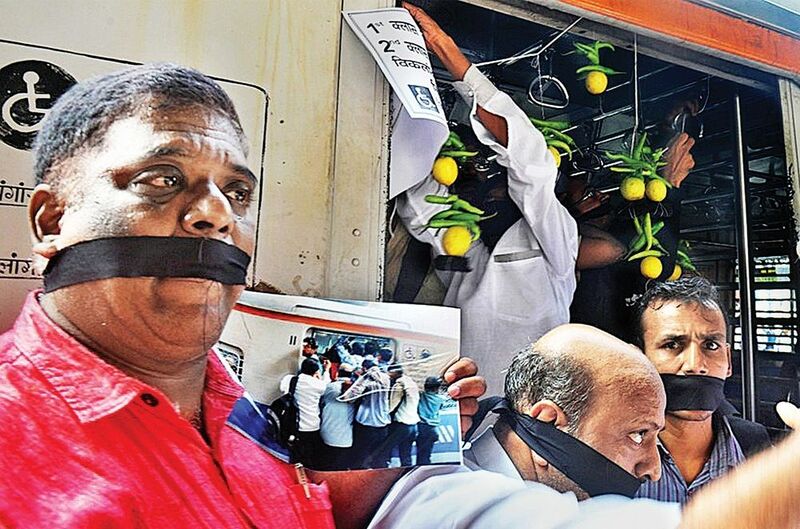 Picture by Chaubhey Vedika, mid-day. The above-mentioned strategic use of the certificates implies that governmental regulations as to whom is entitled to travel in the compartments often do not suffice and are sometimes overruled as the space is governed by the passengers themselves. In these train compartments assigned to disabled people, informal rules for use of space are created, reproduced and challenged. The diversity of the passenger body leads to the production of hierarchies when negotiating (and arguing about) who can enter the compartments and who can not, who can sit and who should stand, and where they should sit or stand (in the compartment or near the doors). These hierarchies are general but not overpowering directives with regard to entitlement to space in the compartments, produced by diverse commuters. There is a tension between formal and informal rules as the produced hierarchies are mediated, but not dominated by the power of medical and disability certificates. It is very hard to outline an overview of hierarchies that are produced, and such hierarchies are necessarily vague and subjective. I am basing the following enumeration on emic classifications derived from deaf people who were my main interlocutors. In general, people with severe leg and back problems (with certificate), very old people (without certificate), very sick people (without certificate, but cancer patients have a certificate) and blind people (with certificate) often come higher in the hierarchies. They are followed by moderately sick people (without certificate), people with minor disabilities (with certificate) and deaf people (with certificate): these latter groups’ presence in the compartments is not so much contested, but their getting seats is ambivalent. Next are some ambivalent categories without certificate: (authorized) escorts of people with disabilities, schoolchildren, and pregnant women (who often stand near the doors). Yet lower on the hierarchy, there are the people who sit on the floor near the door: hijras [i], very poor people without disability, and people with leprosy. I had the impression that most of the time it is not entirely clear what kind of disability or illness someone has. Decisions on what categories such as “very sick”, “moderately sick” or “very poor” mean are based on what people see and how much suffering people demonstrate or argue that they are experiencing. There is both collective and individual variation in opinions, so hierarchies are competing, leading to conflicts. Whether someone will get a seat depends on a number of other factors: having friends or acquaintances in the compartment or not, passengers’ mood and energy levels, how clean someone looks, how miserable someone looks, and the presence of sexism, classism and audism (oppression of deaf people because of their deafness). In producing hierarchies, there are inter-individual differences. Hierarchies are fluid too: who is accepted in the compartment and who will get a seat is contextual, decided on the spot, and not a fixed given reality. In contrast to the presence of (vague) rules about who can enter the handicapped compartment, there are no rules about the occupation of seats, thus people manage the allocation of seats themselves. There are certain codes of conduct on the Mumbai trains (in general, and not just in the handicapped compartments) as to how to manage the occupation of seats: people circulate and swap seats, based on mutual agreement: someone stands for a while (perhaps until a particular train station) and then swaps with another person who then stands, or claims a seat from someone who will alight at a certain stop. 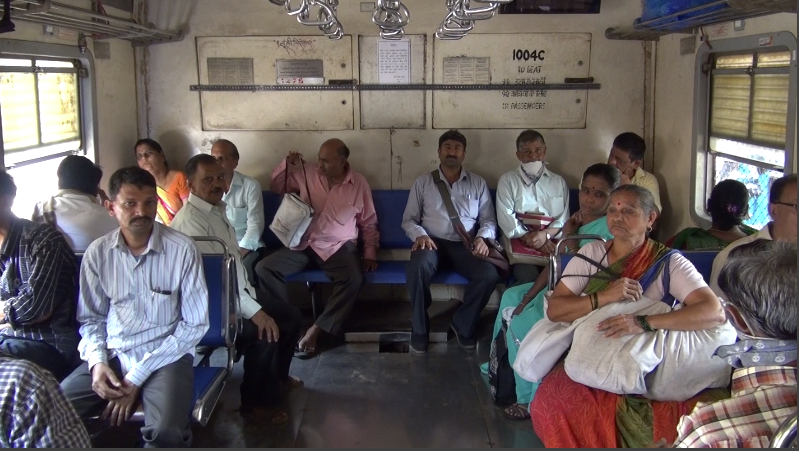 In the handicapped compartments, seat-swapping happens particularly between people who know each other, such as friendly groups of disabled people, and deaf people make use of the wide deaf network in Mumbai. When people have to alight the train, passengers in the handicapped compartment often take it upon themselves to allocate their seats rather than just step off and leave it to the rest to sort out, as such strengthening their connections and friendships, or expressing their views on the hierarchies. Deaf people narrated that when it gets crowded or when it is time to alight, it is sometimes hard to assess to whom to offer their seat: a deaf friend, a disabled person, a weak-looking person, a very old person, or a pregnant woman, for example. It was said that an important criterium in such decisions were existing friendships and when people convincingly demonstrate or argue suffering, such as explaining that they are really in pain or very tired after having stood at their work all day. There is a tipping-point in this practice of empathy/morality which is mediated by poverty though, exemplified by a low tolerance towards ticketless non-disabled people who wear untidy clothes and/or smell. If the disability or misery is present despite having means to care for oneself, then people are more sympathetic. Conflicts and grudges emerge when deaf people do not want to give up seats for disabled people. Indeed, in addition to seat-swapping, it is expected that people promptly pass on seats to people whose bodily conditions put them higher in the hierarchies that exist in the compartments, such as people with a disability in their leg(s). However, deaf people complained that they were often regarded as an easy target by people who were looking for seats, and that hearing people with minor disabilities (such as a missing digit) are usually not the first to be approached. Switching seats after a number of stops was presented by some as a golden middle way to react to a request: not immediately offering the seat to a disabled person but promising or offering it to them after a number of stops (for example, by gesturing “later” or “5 minutes”); as such trying to negotiate a higher position on the hierarchy of seat-deserving people than they are initially ascribed by the other person, but also showing respect for the other person. The regular disabled passengers in the compartment generally agree on who are definitely unaccepted (as opposed to ambivalent) unauthorized travellers and attempt to defend the space of the compartment against them: off-duty policemen who misuse their power; people who fake disabilities, injuries or pregnancy, or carry fake disability certificates; and extremely poor people without disabilities who smell. Problems particularly occur when a mass of encroachers is present during rush hour. Disabled people have difficulties entering or leaving the compartments, and even fall due to pushing. Commuters monitor the use of the space in the compartment and implement problem-solving mechanisms and sanctions such as sending people to the space near the door, sending them out verbally or physically, pulling the emergency chain to stop the train, or reporting people to the railway police. Sending out encroachers is most effective when the compartment is not ‘attacked’ at once by a mass of encroachers. When there is a mass of encroachers, the latter have the benefit of their number. During the past few years, actions by the Railway Protection Force (RPF) in the handicapped compartments have led to fines, arrests and imprisonments. The RPF’s interventions, actions and fines have not proved a sufficient deterrent, leading to huge dissatisfaction and regular protest actions organised by the above-mentioned Disability Advocacy Group (DAG). The DAG for example put up posters in the compartments and on the platforms declaring the compartment as a third-class compartment or a dustbin which everyone is allowed to enter; organised peaceful protests outside train stations; and members forcibly checked disability certificates (they acted as ticket officers and their actions were endorsed and supported by fellow disabled travellers so that pressure was exerted upon people in the compartments to show their certificates). Picture of the most recent protest at disability day on 3 December 2013. Photo by DNA INDIA. In the handicapped compartments there is an absence of clear government regulations and effective enforcements about who can enter the compartments, and there is a total absence of rules about who can sit. Thus commuters in the handicapped compartments create (informal) rules for themselves and enforce these rules upon others. These rules take the shape of informal hierarchies based upon perceived and actual bodily abilities and characteristics. As I have noted, these hierarchies are produced in the moment, through temporary and enduring relationships between people. I contend that even if Bhaskar’s suggestion of a reserved-seat area in the compartment was implemented, people in the compartment would probably continue producing hierarchies in addition to, or instead of, governmental regulations. They do so in order to create inhabitable worlds for the duration of their daily commute. [i] They do not travel in the reserved compartment systematically — they also travel in the ladies compartments and in first class compartments — but sometimes they come in when it is crowded in other compartments. Most of the times they sit on the floor near the door (unless they are disabled), as such not entering the main body of the compartment and avoiding conflict. Kusters A. Regulations versus hierarchies: Commuters creating inhabitable worlds in the Mumbai suburban trains. Somatosphere. 2015. Available at: http://somatosphere.net/2015/regulations-versus-hierarchies-commuters-creating-inhabitable-worlds-in-the-mumbai-suburban-trains.html/. Accessed April 26, 2019. Kusters, Annelies. 2015. Regulations versus hierarchies: Commuters creating inhabitable worlds in the Mumbai suburban trains. Somatosphere. 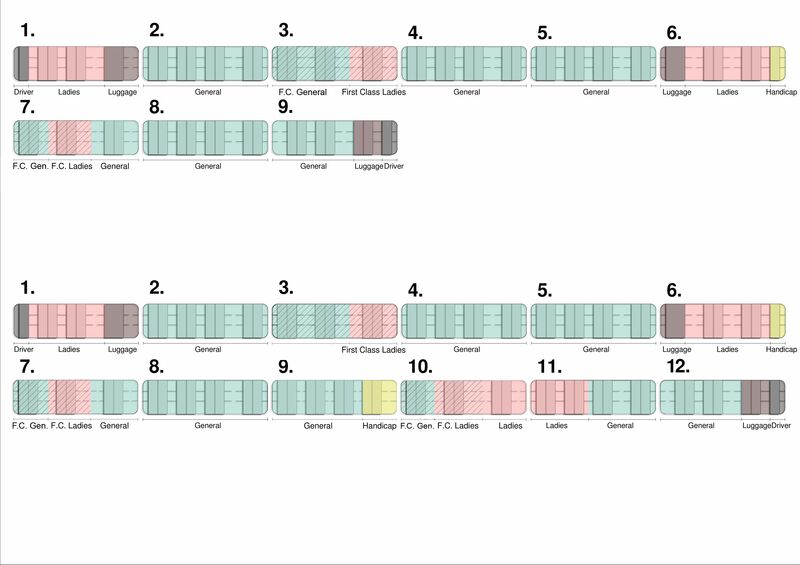 http://somatosphere.net/2015/regulations-versus-hierarchies-commuters-creating-inhabitable-worlds-in-the-mumbai-suburban-trains.html/ (accessed April 26, 2019).